"This is a wonderful appetizer for oyster lovers. Simple to prepare with readily available ingredients. Great for unexpected guests. 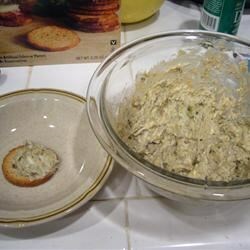 Spread on Baguettes or dip with crackers." In a medium bowl, mash oysters with a fork. Mix in cream cheese, Worcestershire sauce, and lemon pepper. You can use hot pepper sauce instead of Worcestershire sauce as a variation. Spread on baguettes, or dip with crackers. My choice is thin wheat crackers. Tastes wonderful. Love the smoky taste. The seafood taste of the oysters reminds me of a salmon pate. ty for the wonderful recipe.